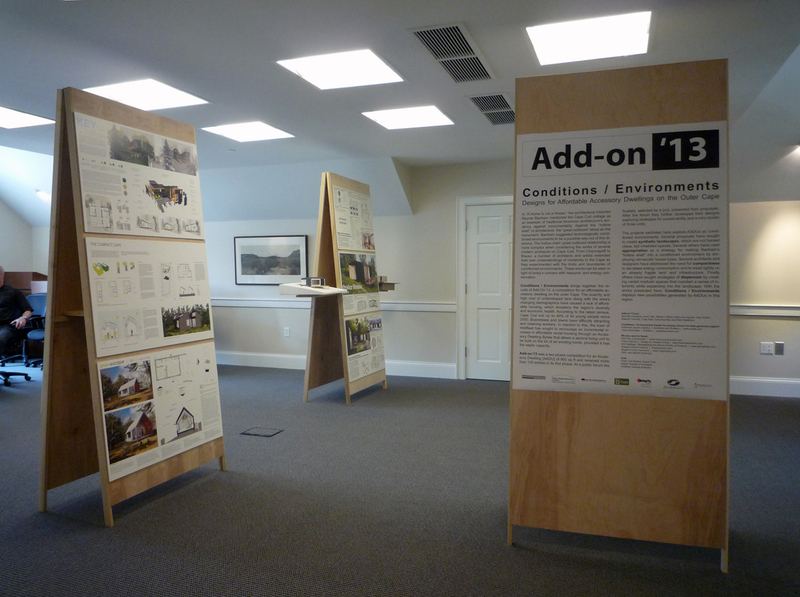 Conditions / Environments, Add-on'13 exhibition, will be on view until November 15 at the BSA Space in Boston. 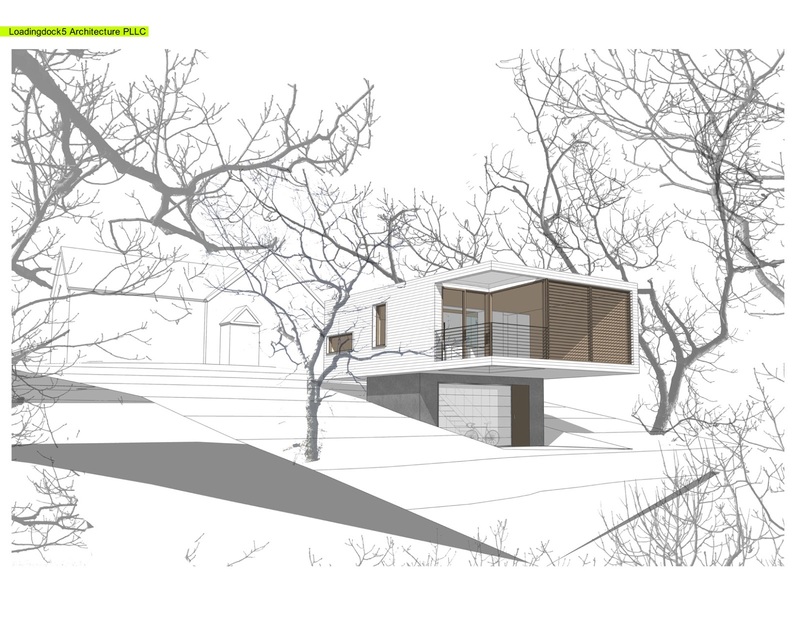 The exhibition features the work of the finalists along with selected proposals from the first phase of the competition. Please click here for more information on the exhibition and the BSA Space. 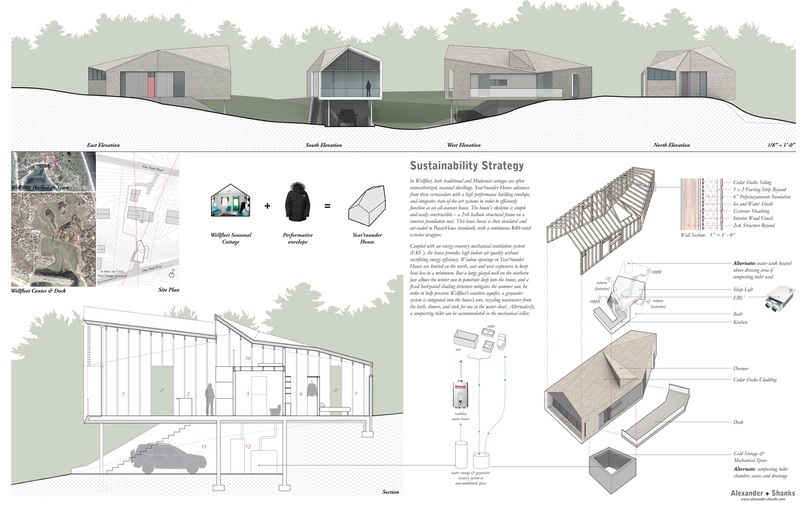 Conditions / Environments brings together the results of Add-On’13, a competition for an affordable accessory dwelling on the outer Cape. 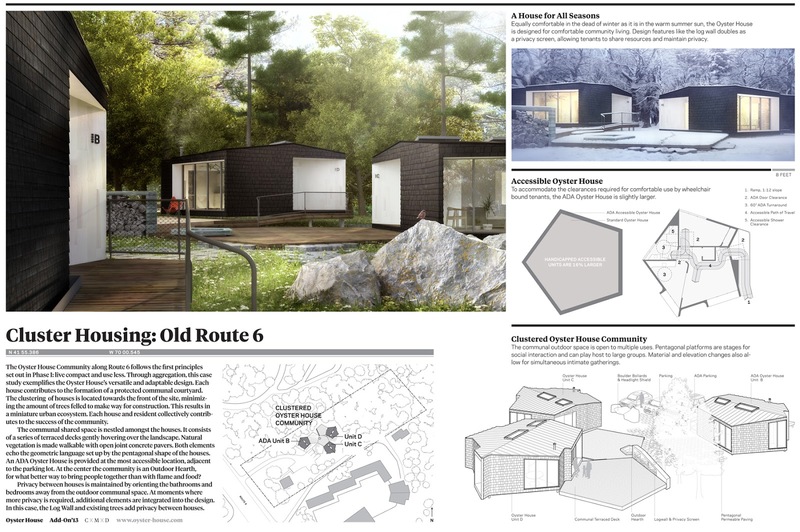 Reflecting back on the modern architectural heritage of Cape Cod and considering the current conditions of its towns, the competition sought for proposals for an Affordable Accessory Dwelling. 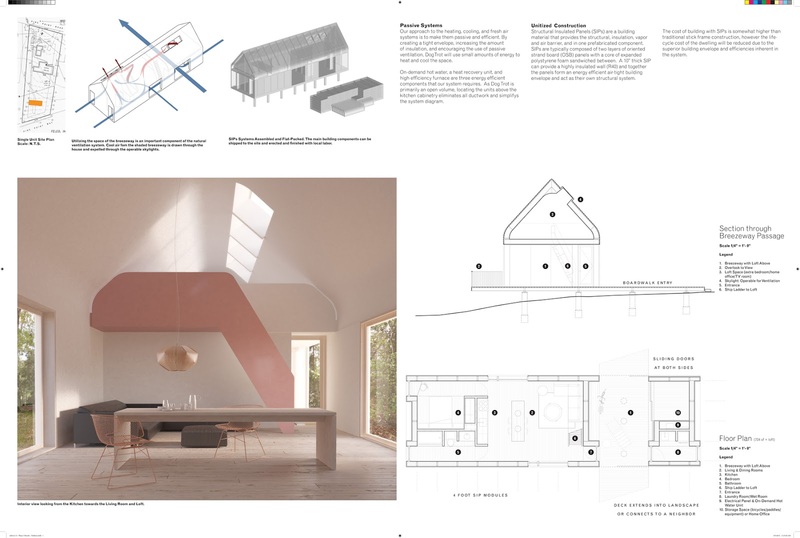 The competition intended to highlight some of the problems of the region, its modern heritage as well as the urgency to engage with affordable dwelling in a rural context. Perhaps most importantly, the competition arose from the conviction that affordable housing deserves good design and sought for inventive propositions for the problem. 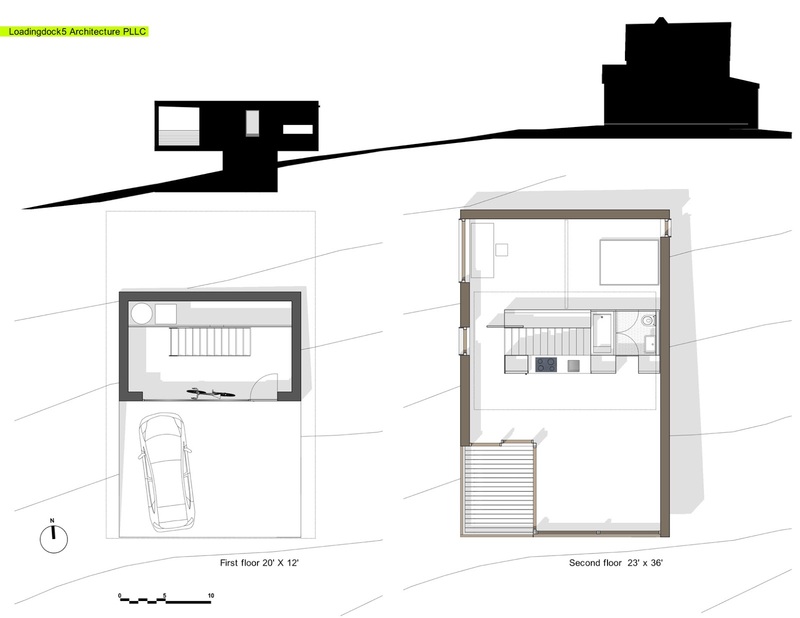 Dwellings can be defined as conditioned environments. 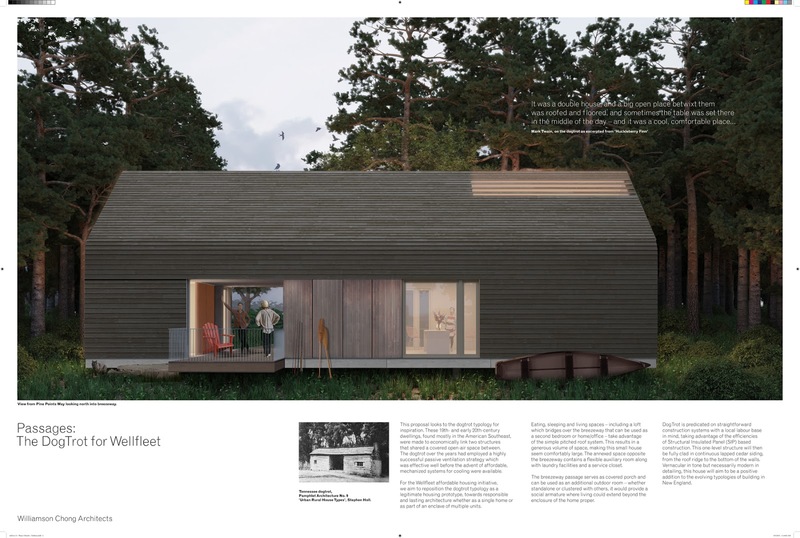 For example, in “A Home Is not a House,” the architectural historian Reyner Banham mentioned the Cape Cod cottage as an example of traditional American architecture’s tendency against monumentality. Against the “hollow shell” of architecture, the “great outdoors” stood as the monument. Banham suggested technologically conditioned environments to be a possible way out of this dilemma. 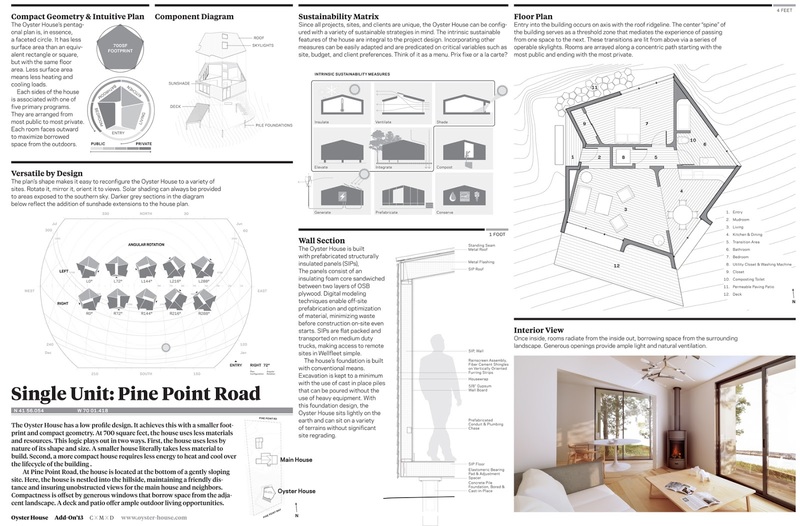 The hollow shell / great outdoors relationship is more complex when considering the works of several modern architects on Cape Cod. 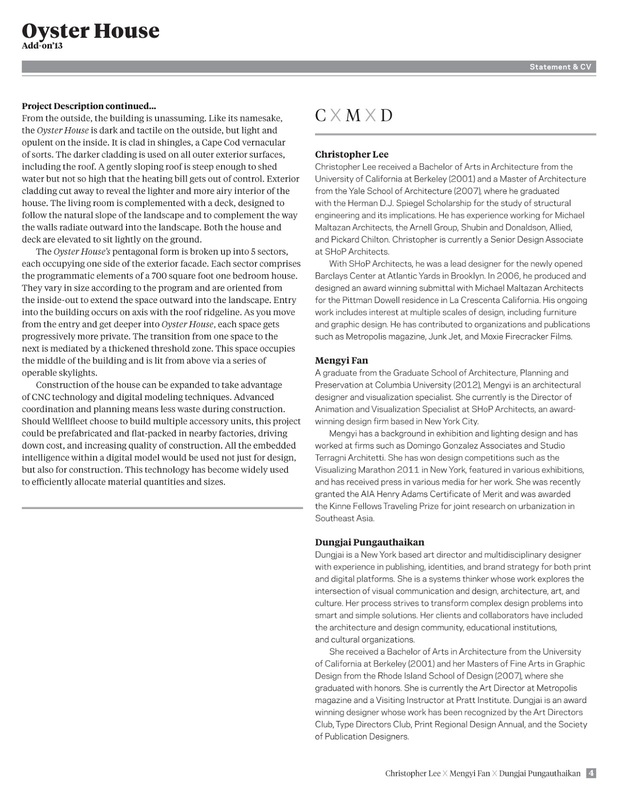 From Chermayeff to Breuer, a number of architects and artists extended their own understandings of modernity to the Cape as they experimented with the limits and boundaries of conditioned environments. These works can be seen in light of today’s concern with resource and energy conservation. 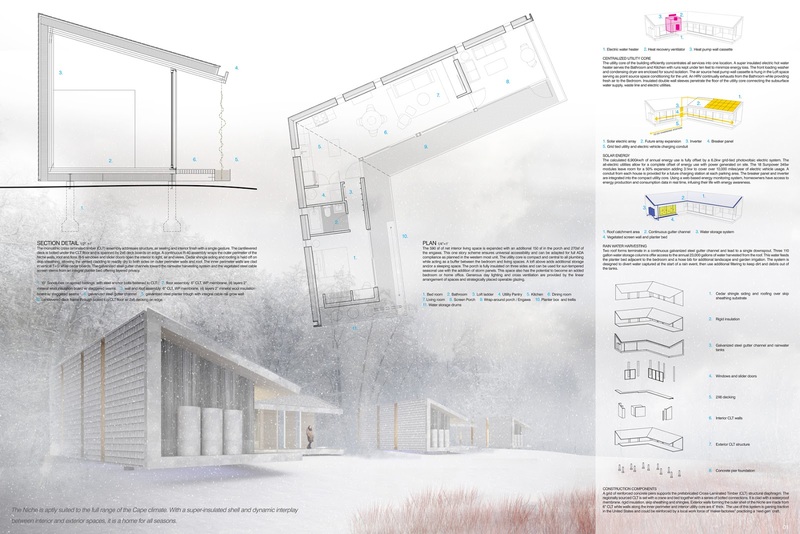 The projects exhibited here explore AADUs as conditioned environments. 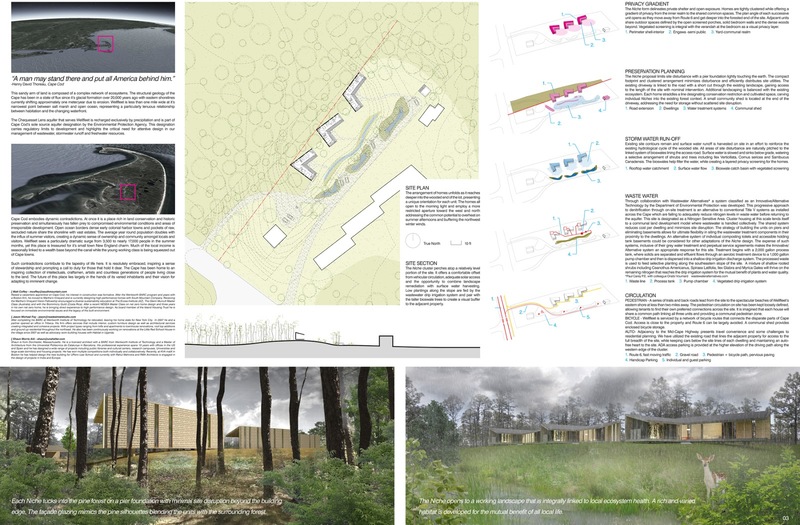 Several proposals have sought to create synthetic landscapes, which are not framed views, but inhabited spaces. 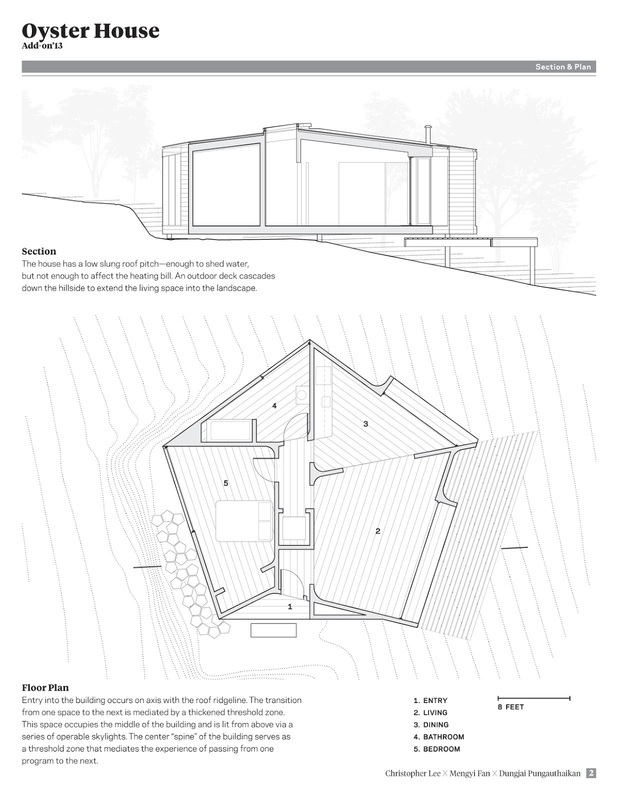 Several others have used appropriation as a strategy for making Banham’s “hollow shell” into a conditioned environment by employing vernacular house types. 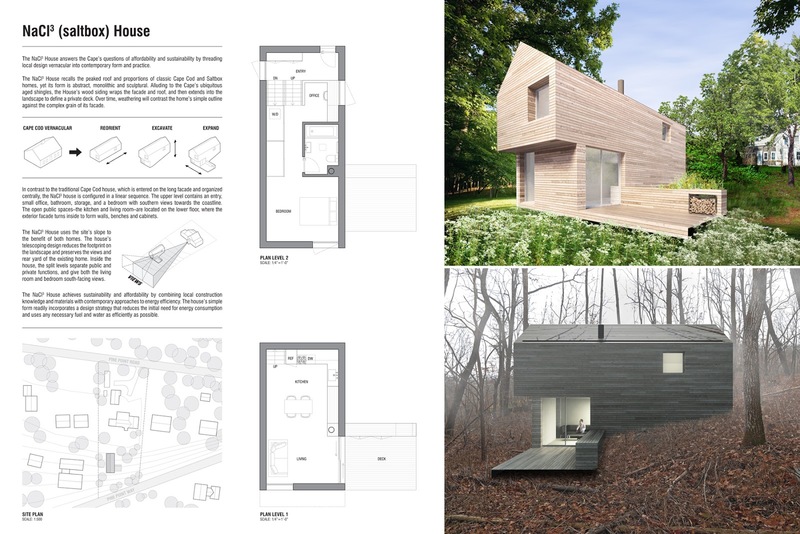 Several architects and designers have addressed the need for compactness to decrease energy consumption and to tread lightly on an already fragile land and infrastructure. 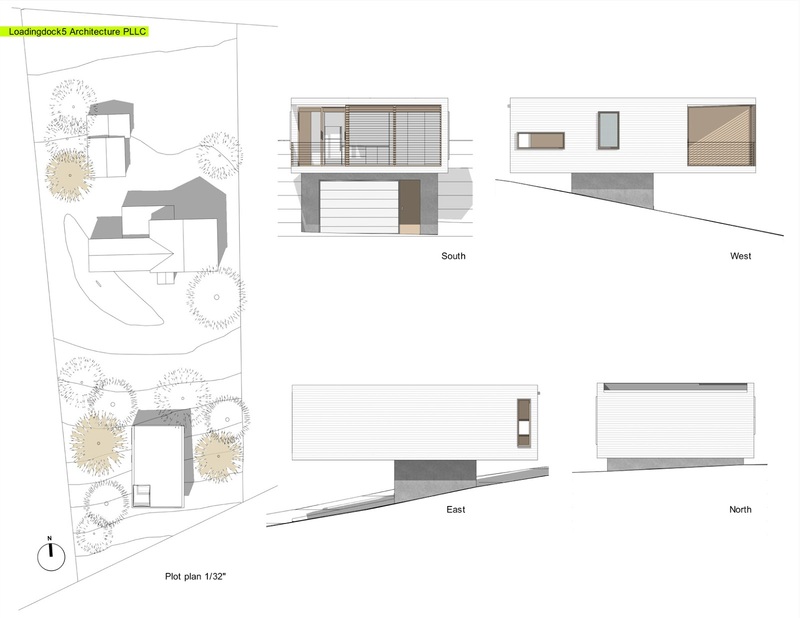 Finally others have sought strategies of dispersion by creating varied modular spaces that maintain a sense of interiority while expanding into the landscape. 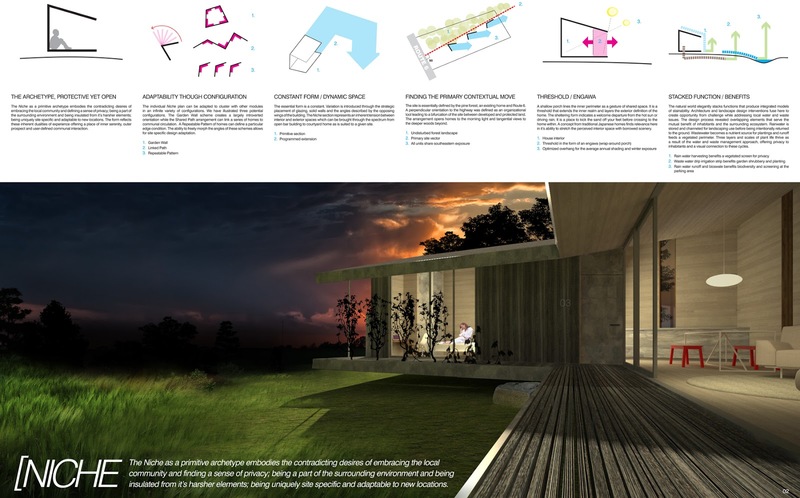 The projects expand the notion of environment. Framed in terms of land ownership, land use, changing demographics, and the needs of a community, environment becomes legal and social. 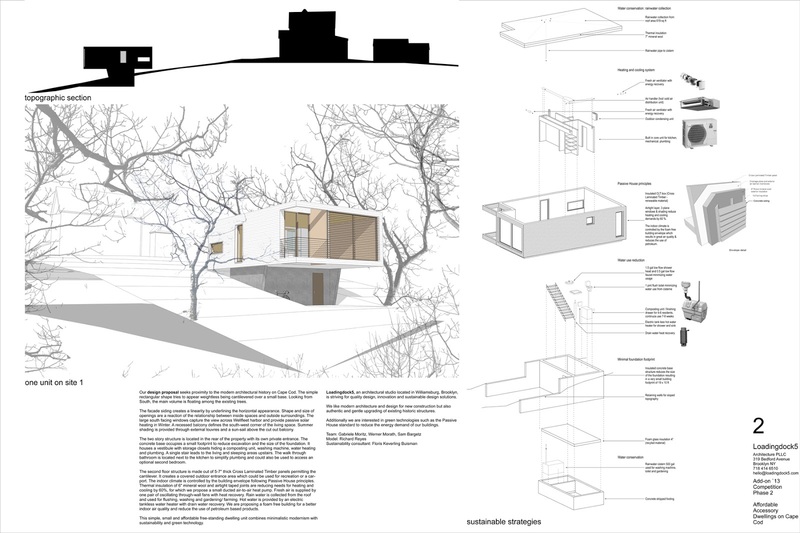 With the works presented here, Conditions / Environments displays new possibilities generated by AADUs in this region. 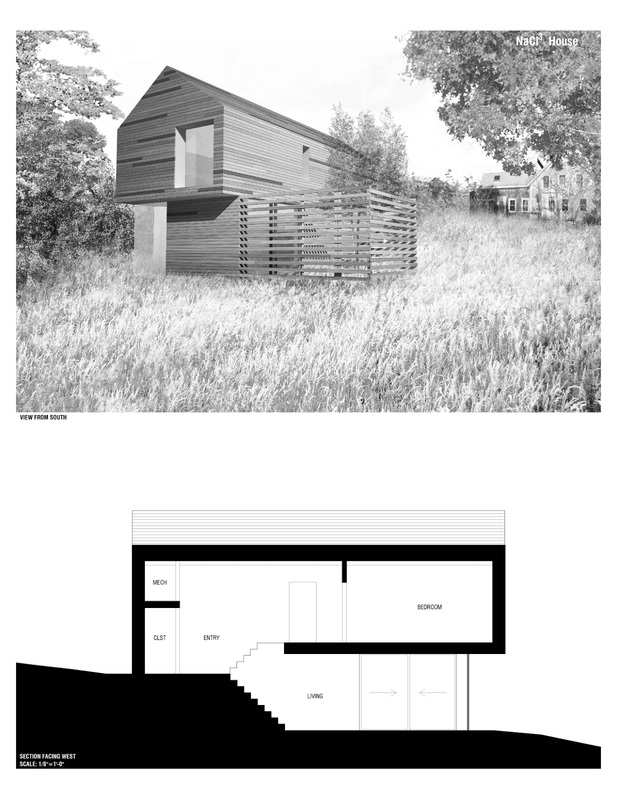 We are pleased to announce the results of the final jury for Add-on’13, affordable accessory dwelling for the outer Cape competition. After careful deliberations, the jury awarded the first place to CxMxD’s Oyster House entry. 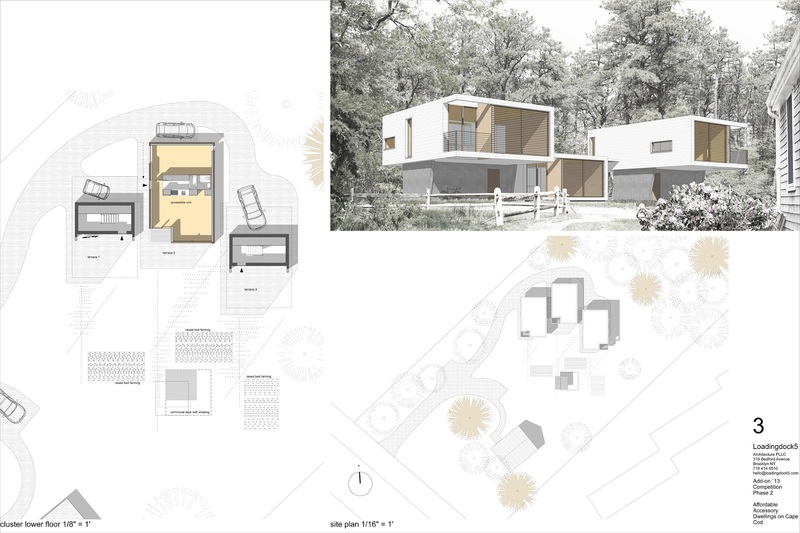 The evaluation criteria were based on aesthetics, livability, buildability (coherence of design and detail), site strategy and the social space of the cluster proposal. 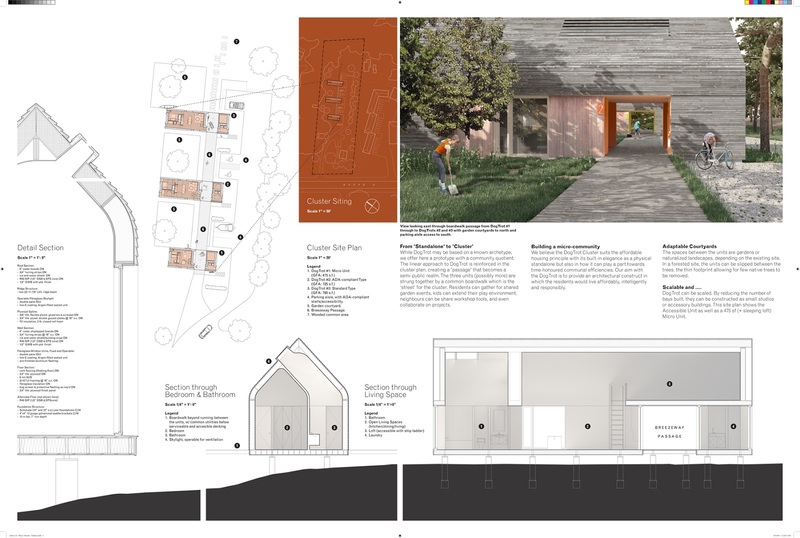 The winning project by CxMxD addressed the cluster of three units as an outdoor space with communal qualities. 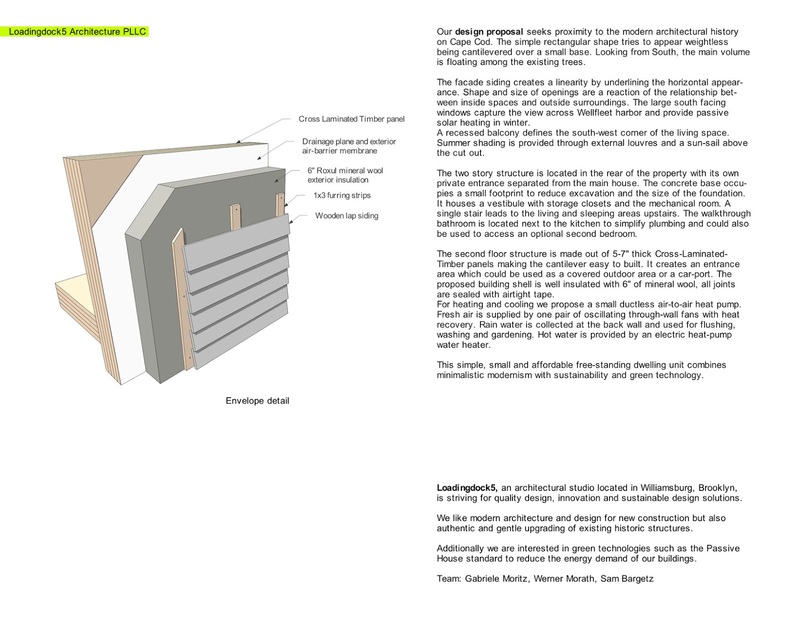 The jury thought that the project has potential for further development in this context. The jurying process included the public vote, which was considered as one jury member, and the jury members: Mary-Ann Agresti, Tulay Atak, Malachi Connolly, Kenneth Frampton, Peter McMahon, Duks Koschitz, William O'Brien Jr., Gary Sorkin, Anne Tate. 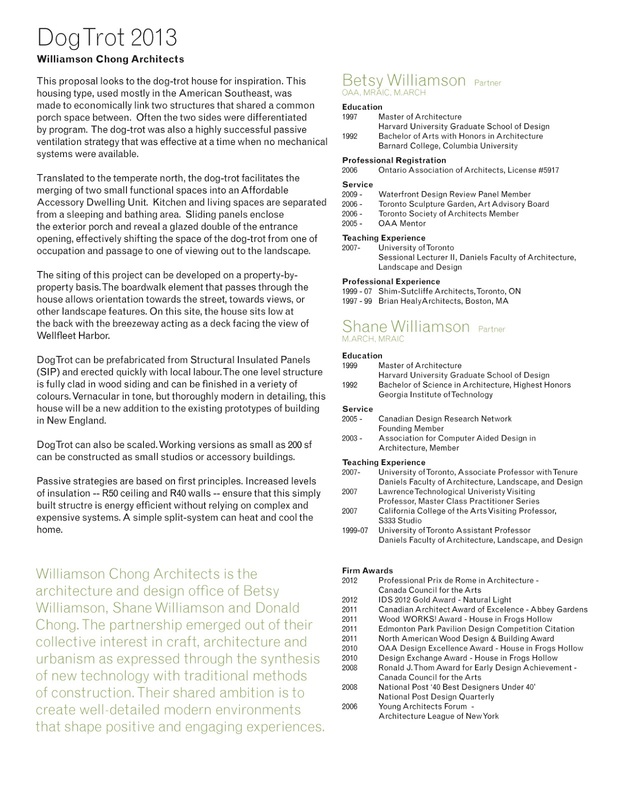 The exhibition, Conditions / Environments travels to The Boston Society of Architects headquarters in Boston opening early October. 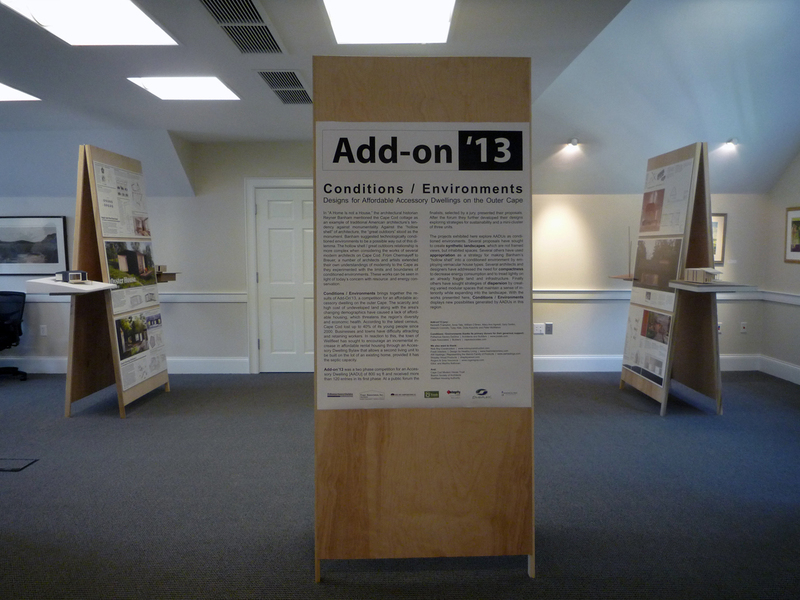 Add-On'13 Exhibition, Conditions / Environments opens today. Please come and join us for the reception on August 13, 4-5:30 pm at Seaman's Bank, 2746 U.S. 6, Wellfleet, MA. Add-On'13 will be ending the week of August 12th with an exhibition, public voting and final jury. The exhibition, Conditions / Environments, brings together selected proposals from the initial phase of the competition along with the developed proposals of the finalists. 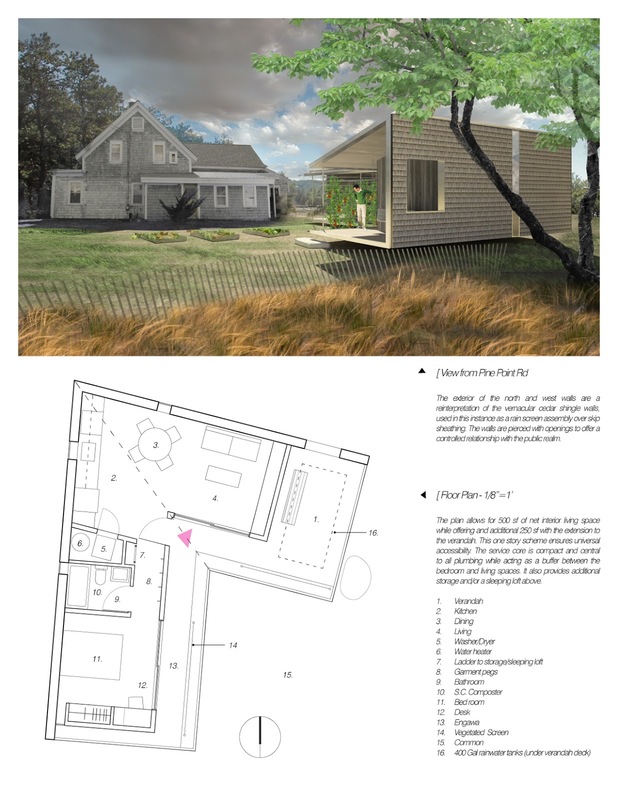 The public will be able to support their favorite project by voting at Seamans Bank, Wellfleet, Monday, Aug. 12, 1pm-4pm. 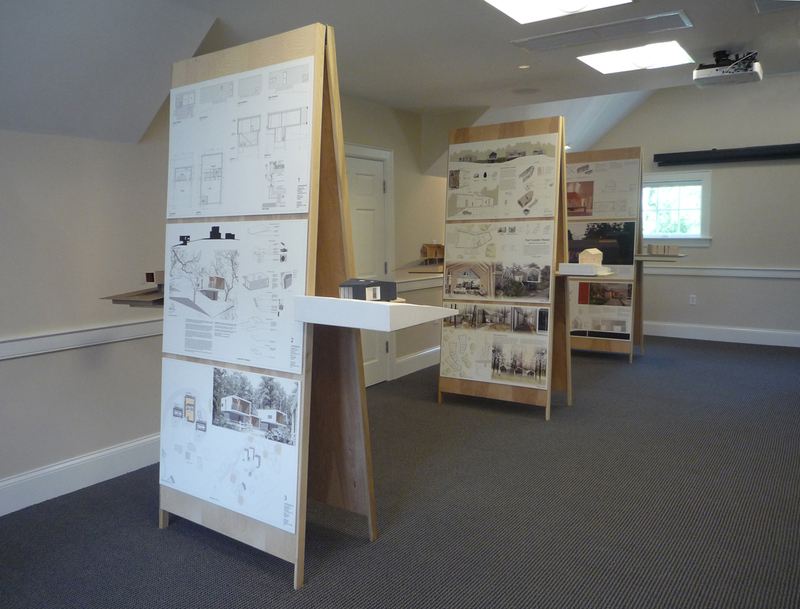 The exhibition will also be open Aug. 14, 15 and 16, 1pm-4pm and will travel to the Boston Society of Architects gallery in October. The exhibition will take place between August 12-18 in Wellfleet and will then travel to the BSA Gallery in Boston. 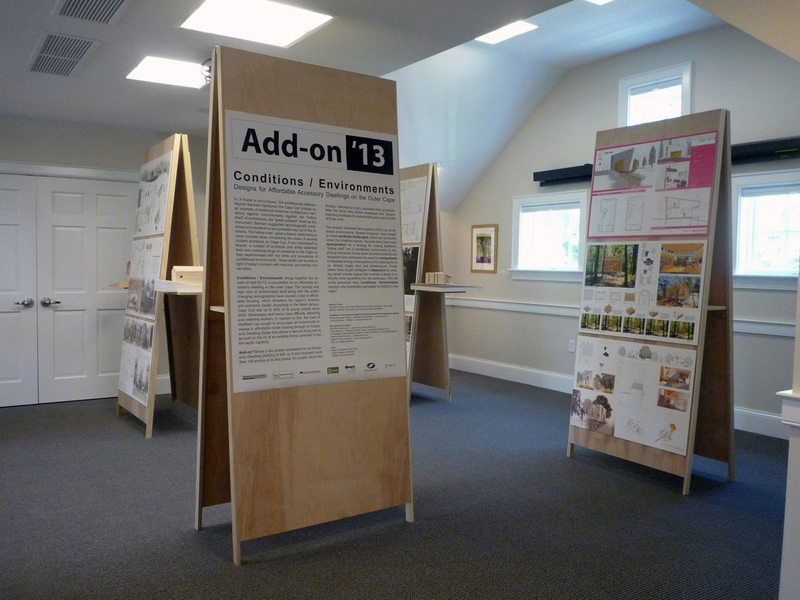 We have expanded our funding efforts to organize the Add-on'13 exhibition. We have informed the selected participants and will post their names soon. 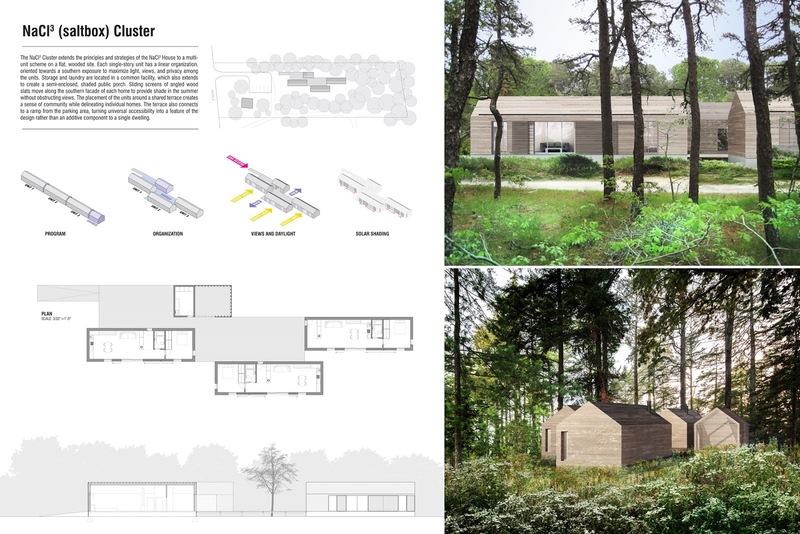 The exhibition will take place in Wellfleet during the time of the final jury and will travel to the BSA (Boston Society of Architects) in Boston. 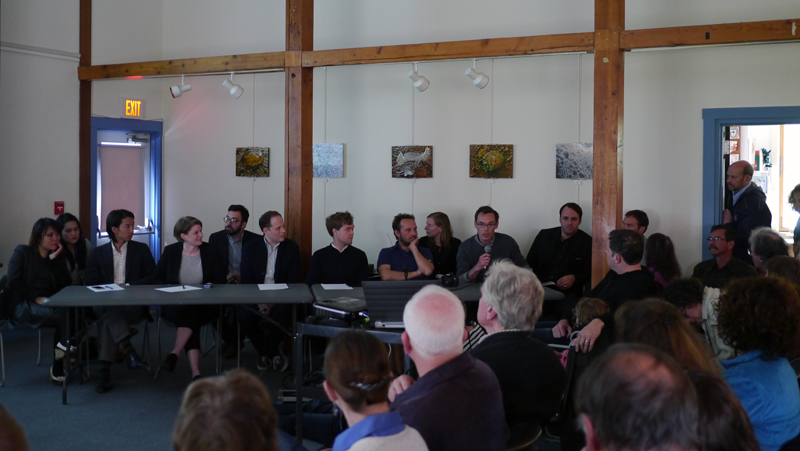 The finalists have presented their projects at the public forum Wellfleet Public Library on May 26. 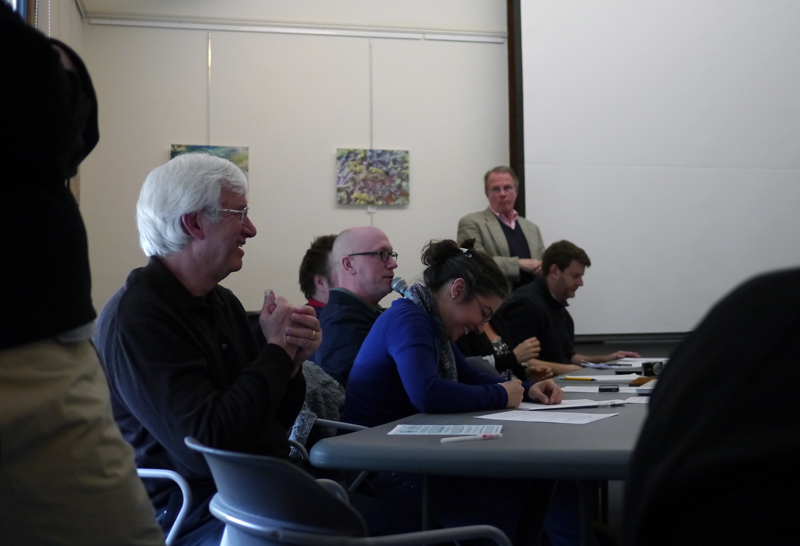 With a great turnout, the exchange was lively. 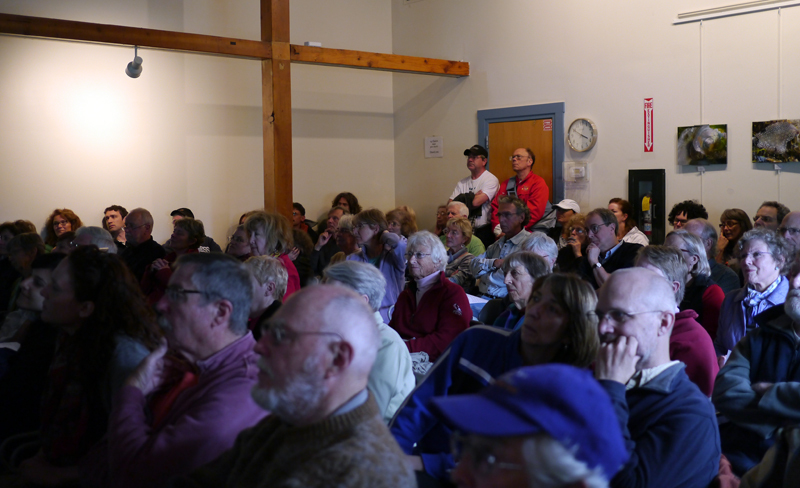 We are excited about the Wellfleet Forum on May 26th. 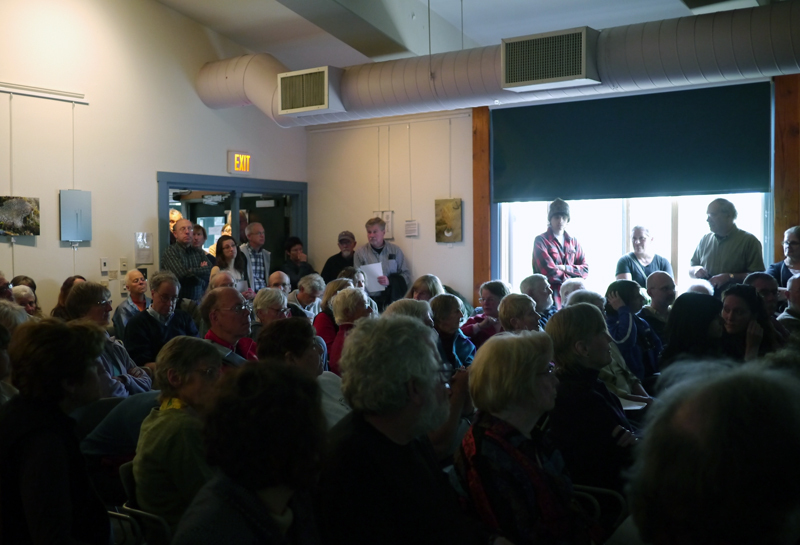 It will be at the Wellfleet Library, 55 West Main St. and will allow the finalists to meet with local citizens and members of town boards, which regulate and promote affordable housing. People potentially interested in building AADU's are welcome to come by. After an introduction and explanation of the competition, the finalists will have five minutes to briefly present their proposals. A discussion will follow in which everyone can ask questions and share information. The event is sponsored by the Wellfleet Community Forum. We will be using insights gathered at the Forum to refine the requirements for the single and mini-cluster specifications in Phase 2. 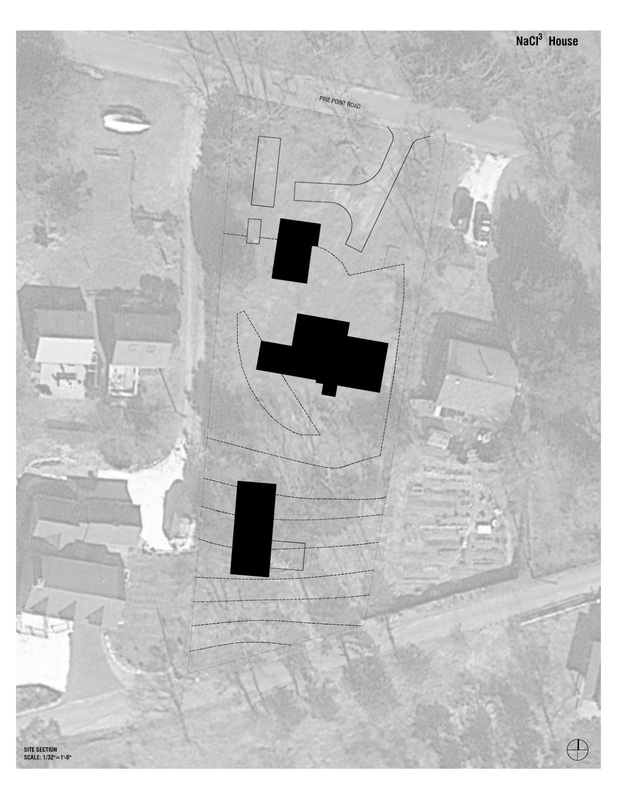 The site plan for the mini-cluster lot has finally been determined. The city has actually proposed affordable housing on this lot and for the purpose of the competition, the finalists will assume that the lot is empty. Here are the six finalist projects by alphabetical order. Please click on the images to see the larger versions. We want to thank everyone who participated in the competition. We received well over 100 submissions and the jury has made its decision regarding the six finalists. We will upload these projects to the this site soon. We received so many strong proposals that we have decided to organize an exhibition as we believe that many projects should be seen and discussed publicly. We will notify the teams whose projects we would like to include in the exhibition next week, once we determine the exhibition space capacity. Please stay tuned for future developments. 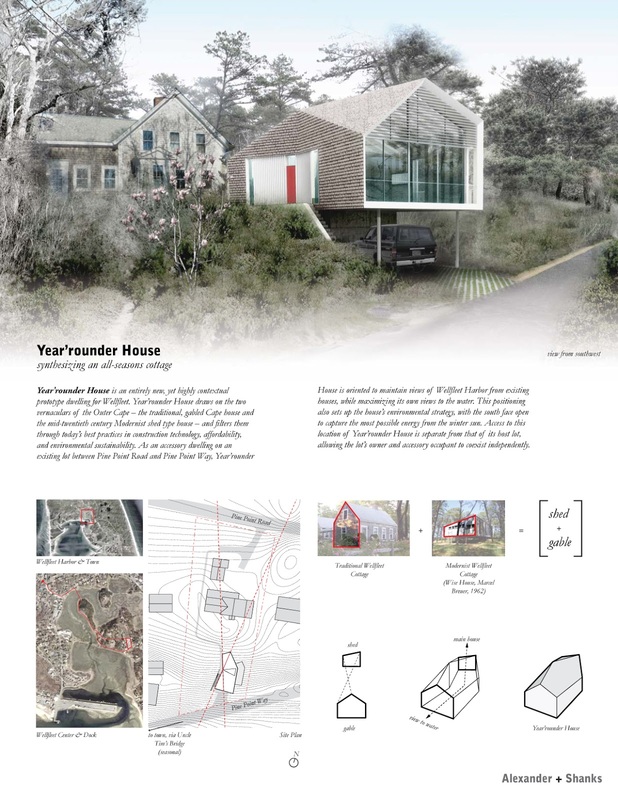 This two-phase competition seeks design proposals for a freestanding, affordable, accessory dwelling unit on outer Cape Cod. 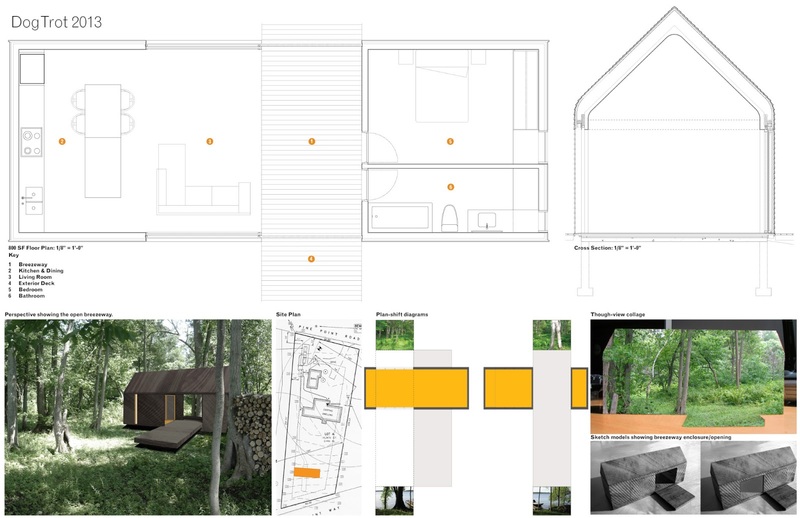 We hope to bring together local experts and the broader design community in order to develop fresh thinking about housing, resource conservation, and the relationship between the natural and built environment. 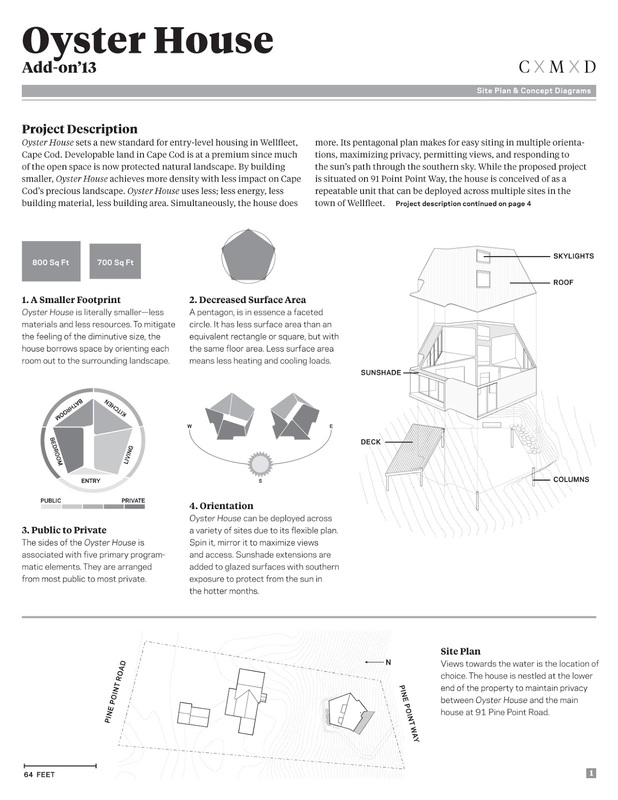 Add-on is a way to consider the role of affordable housing in a context outside the city and re-envision the relationship between architecture, infrastructure, resources and land. Cape Cod is an environmentally fragile piece of land projecting out into the Atlantic Ocean from New England's coast. The landscape and vegetation have changed along with settlement patterns. Currently, the scarcity and high cost of undeveloped land along with the area's changing demographics have caused a lack of affordable housing which threatens the region's diversity and economic health. At the same time the Cape's delicate freshwater aquifer is threatened by overuse and contamination. While, in general, development has followed traditional rural/suburban patterns of a one family house per building lot, it's clear that there is a need to begin exploring new paradigms in the coming decades. The outer Cape has a rich history of architectural innovators such as Marcel Breuer and Serge Chermayeff who both spent much of their careers thinking about community and low cost housing. 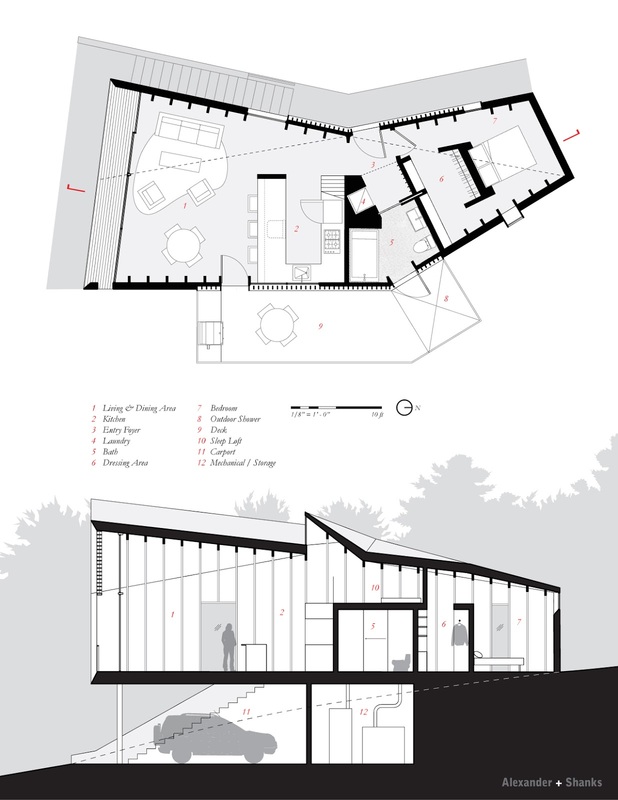 The works of these and other architects provide a rich heritage of building experimentation. 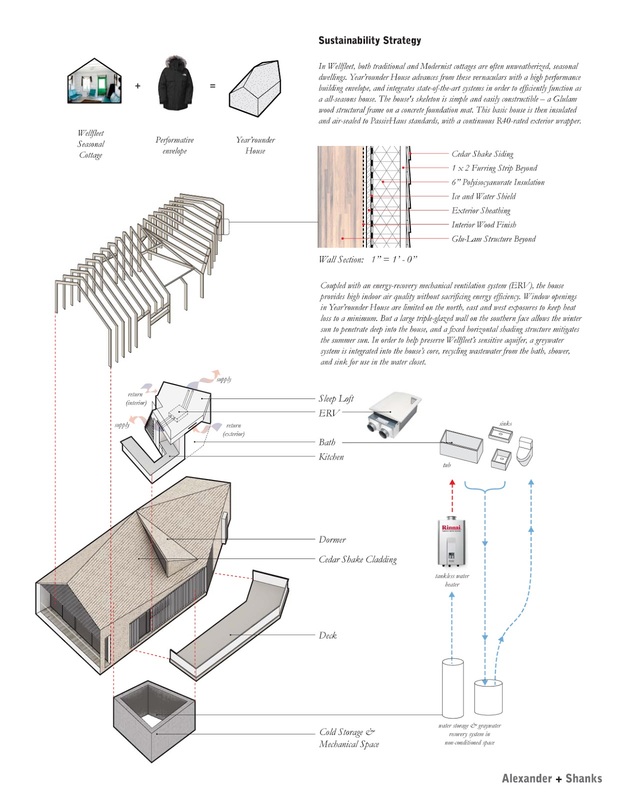 The town of Wellfleet has sought to encourage an incremental increase in affordable rental housing through an Accessory Dwelling bylaw which allows a second living unit to be built on the lot of an existing home, provided it has the septic capacity. 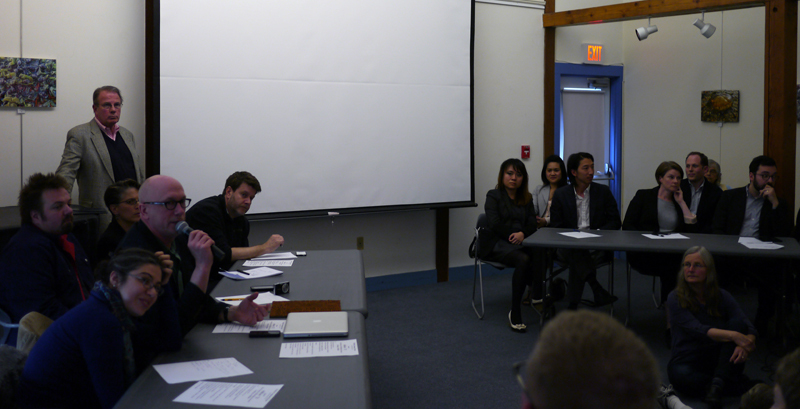 Participating property owners in Wellfleet commit to renting these units at an affordable rate. There is financial support through tax relief and grants for homeowners who participate. Wellfleet, today, has 11 accessory dwellings. 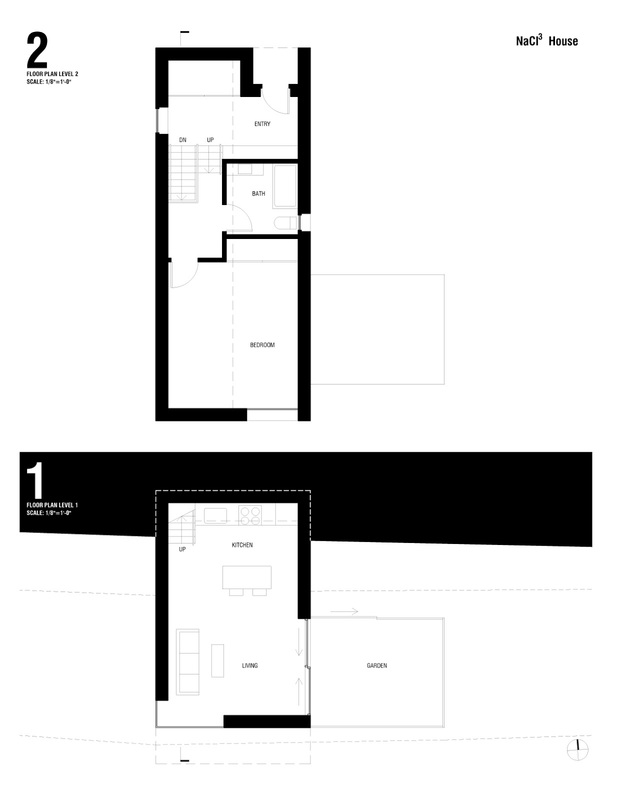 In Phase One, participants are invited to submit innovative designs for a freestanding, 800-sf one-bedroom unit. The proposal should include strategies for limiting the use of local resources and energy. Submissions will be accepted via email. 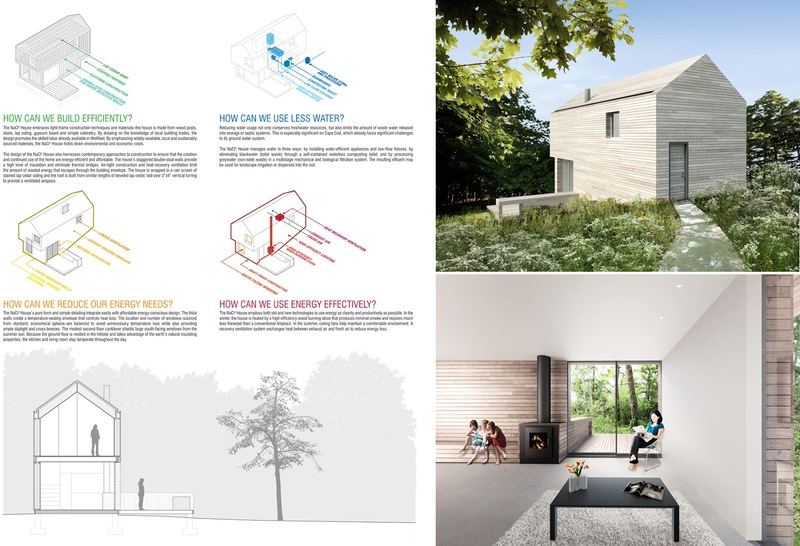 In Phase Two, finalists will develop their designs and propose construction strategies that are suitable for local needs and a modest budget. 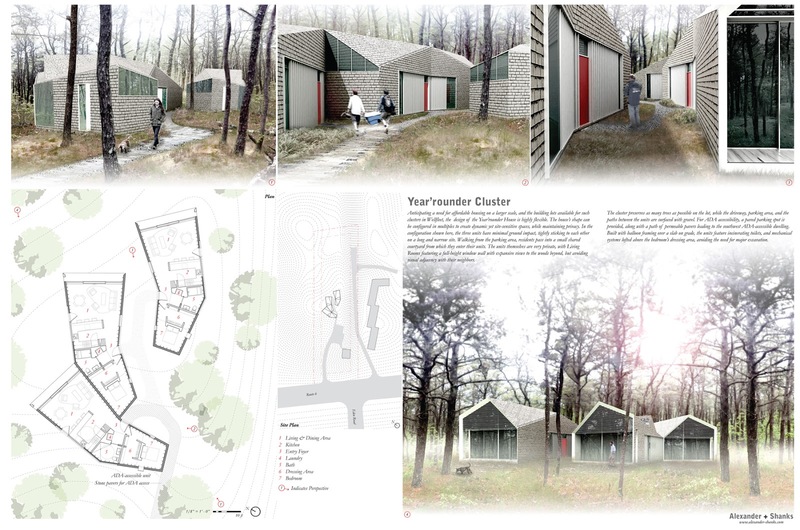 The proposals will include a conceptual idea for cluster housing. 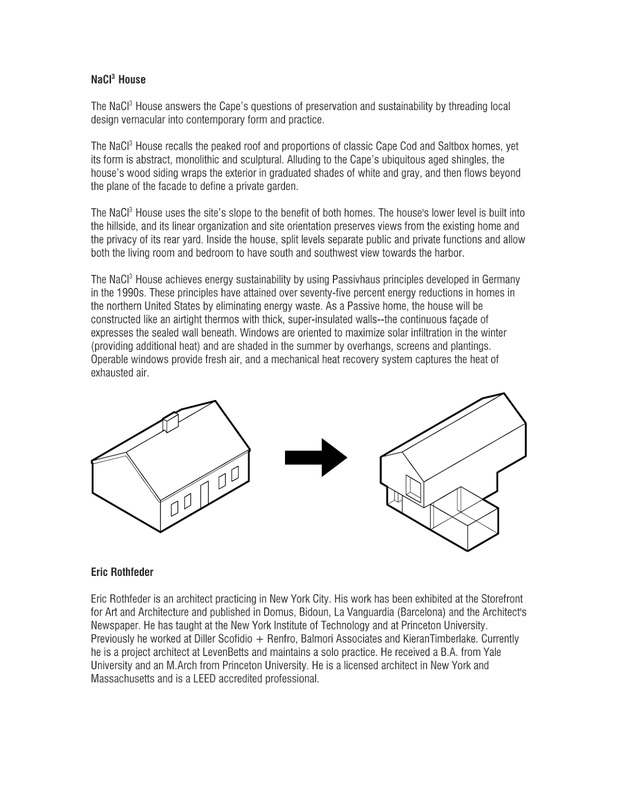 Finalists chosen by the jury will be hosted for a week-long residency in either the Kugel/Gips House or the Hatch Cottage, two significant modern houses restored by the Cape Cod Modern House Trust (CCMHT). 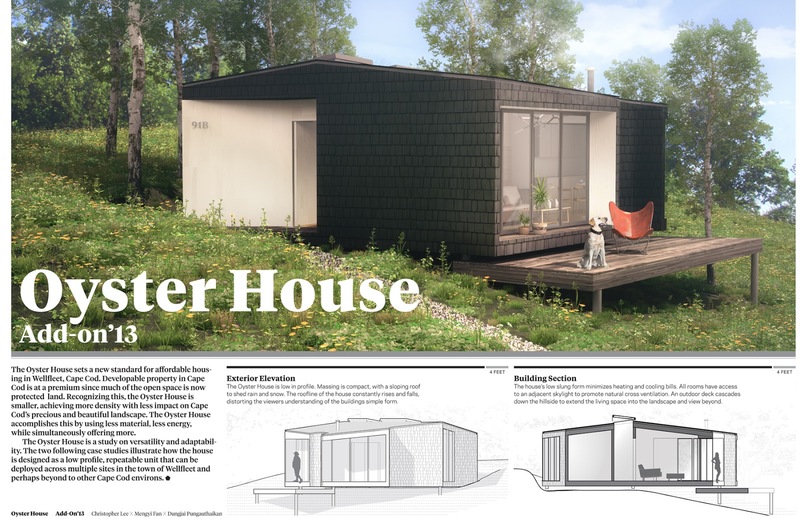 Following site visits and a tour of local, modern houses, a public forum will provide a platform where designers, local officials and potential clients, such as interested property owners and renters, will share information and concerns. The final jury will meet August 13th to choose a first-place winner, who will receive a cash prize. There will also be two honorable methentions. The public will have the opportunity to cast ballots and the jury will consider the vote. 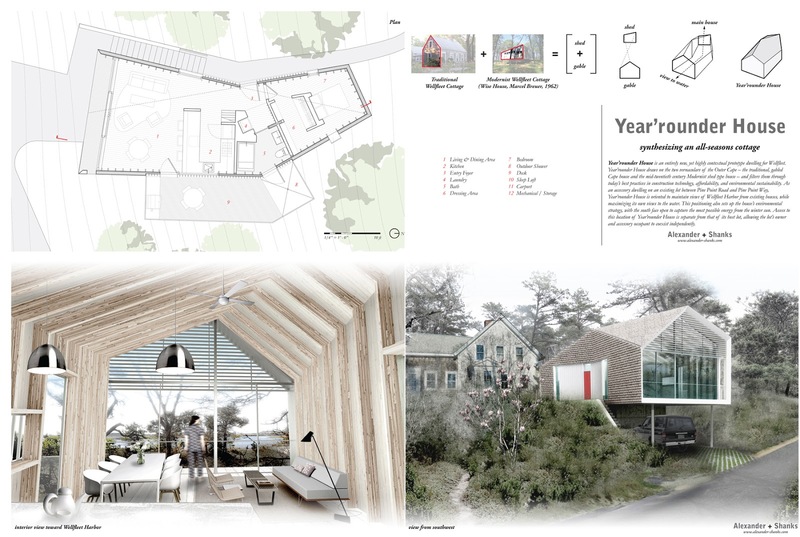 The finalists' projects will be displayed at the Wellfleet Library, Boston Society of Architects (BSA) gallery in Boston. The exhibit may also travel to other locations on the Cape and Islands. Affordable housing is worthy of good design. 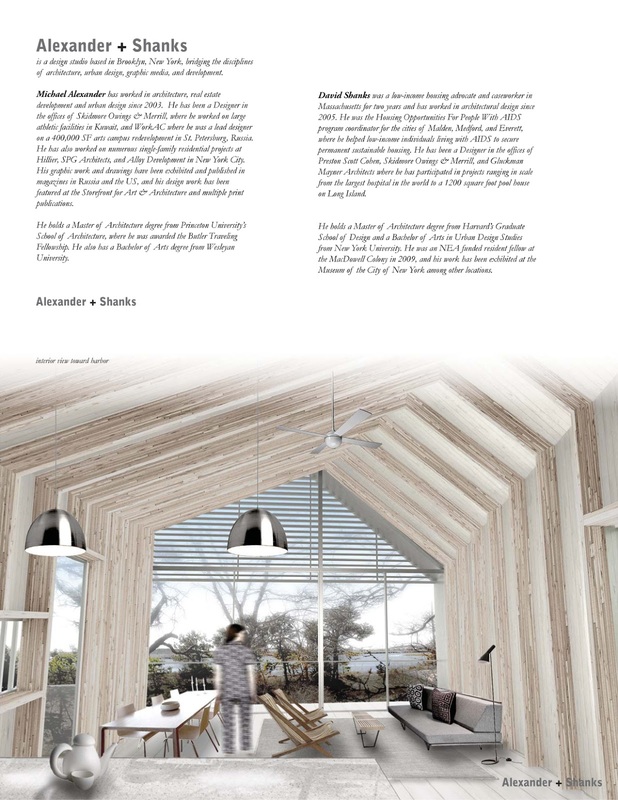 With Add-on '13, we invite designers to address the pressing issue of rural affordable housing in inventive ways. 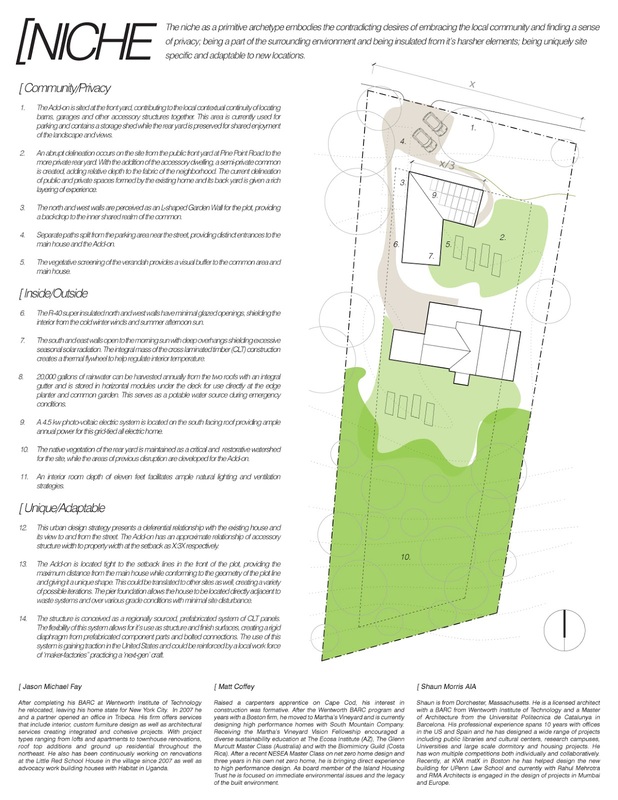 We hope to encourage home-owners to consider building units on their land. 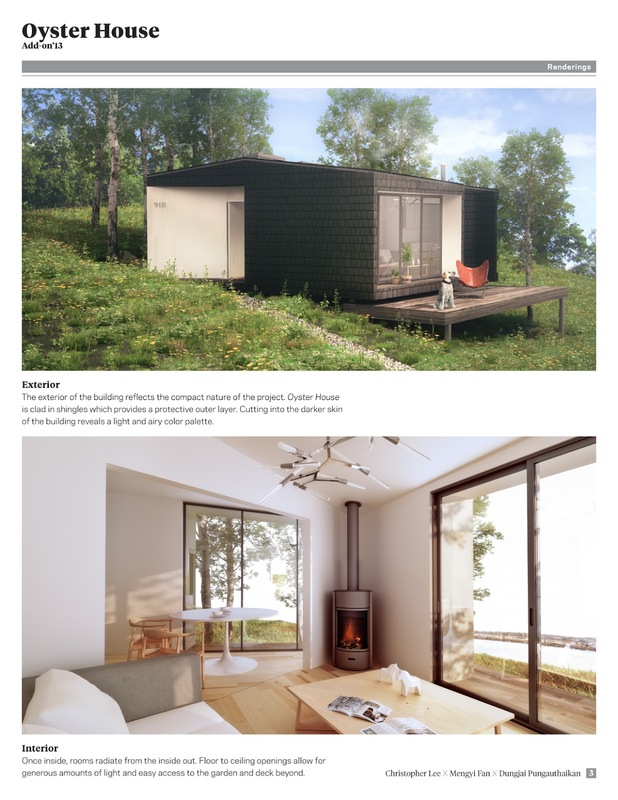 We also hope to interest other towns on the Cape to pass bylaws which can allow for accessory dwellings that provide a way to increase rental units in an incremental and diffuse way. 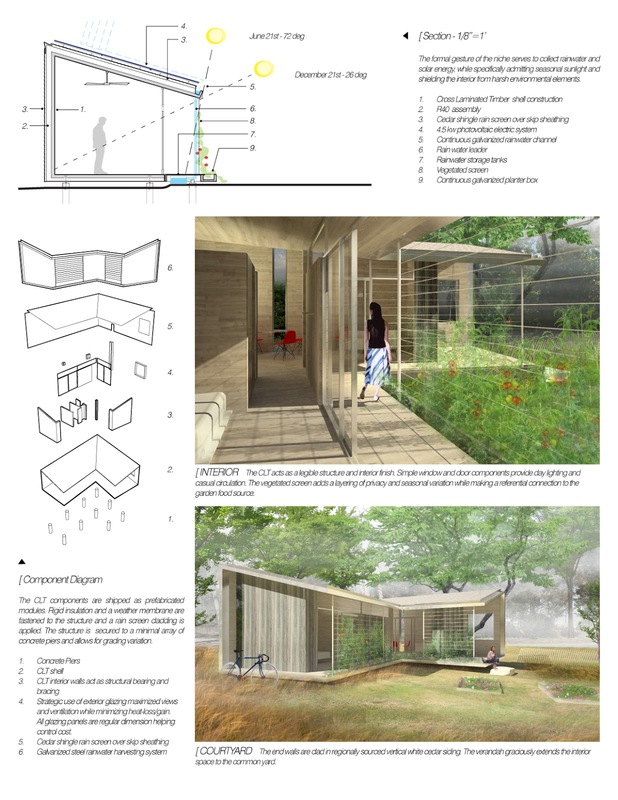 The competition is open to designers, architects, builders and students, who live in the United States. Participants can work individually or in teams. Please send an email to: addon2013@gmail.com if you intend to participate in the competition. You will be notified on updates and news.